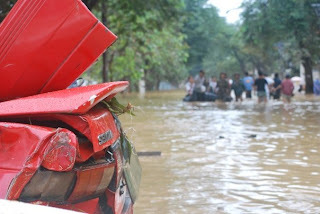 240 people were confirmed dead, over 40 missing, and 340,000 are left displaced after the Tropical Storm Ketsana, locally known as Typhoon Ondoy, hit Metro Manila on Saturday, September 26, 2009. President Gloria Macapagal-Arroyo has declared a state of calamity in Metro Manila. This coming weekend another storm is forecasted to hit the Philippines. Typhoon Parma has now been designated as a supertyphoon as wind speed reached 240 KPH. Its winds are forecasted to strengthen by 259 KPH by 8:00 am tomorrow morning, making it a CATEGORY 5 storm, the strongest on the Saffir-Simpson scale of cyclone strength. Such storms are capable of causing "catastrophic damage" and can blow roofs off residential and industrial buildings, according to the U.S. National Hurricane Center. After typhoon Parma, another supertyphoon is predicted to hit the Philippines again. Our team at WE International Philippines are working tirelessly to provide support and assistance to disaster relief missions. WE are accepting monetary and in-kind donations on a rolling basis to help those affected by the typhoons and floods. I have been touched by the compassion that overflows around me as EVERYONE I know is contributing in some way to help victims of the floods. But WE still need your help. Hundreds of people are dying from starvation, illnesses and infections. And many have lost their families, their homes, EVERYTHING. Please visit our website at http://www.weinternational.org.ph/typhoon-ondoy to make an online donation via PayPal, or contact me for information on where you can send In-Kind donations. Also, please help us spread the word on the situation here in the Philippines and what we are doing to help. I will be updating the information on the website daily so you guys know what's going on here.